Last year during the price rotation in February 2018, we hypothesized the current rotation was not the end of a 5-Wave Elliot Wave formation. We believe the January 2018 highs are potentially the end of Wave 3 which is part of a much larger Wave A upside price swing. Our research suggested that the retracements in 2010 and 2011 were not sufficient to qualify as any type of traditional Elliot Wave structure, thus the retracement in 2015 qualified as a Wave B formation. This presented an upside Wave A size of +366%, or +$89.66, on the QQQ chart. The Wave C move, from the lows of 2015 to the highs of 2018, presented an upside Wave C size of +121%, or +$102.77. Given these Wave A and C sizes, we believe the upside potential of a final Wave E (the last wave higher) in the US stock market could be at least 100% to 161% the size of the last Wave C formation. 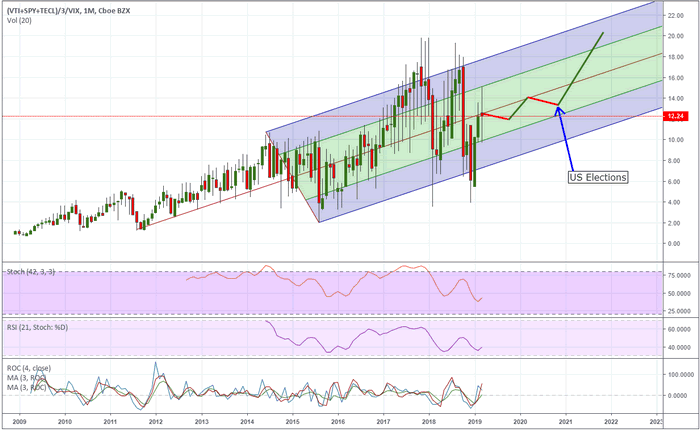 This presents a very interesting possibility that our most recent article about the Treasury Yield Inversion and the concerns about a pending recession may be setting the wrong tone for traders. Yes, the 2020 Presidential election cycles typically result in some price rotation and sideways trading for US stocks. This may hold true over the next 16+ months before the elections and there may not be much we can do about it other than trade these price rotations. After the elections, though, we believe the upside price potential for the US stock market could be incredibly under-estimated. How under-estimated, you ask? 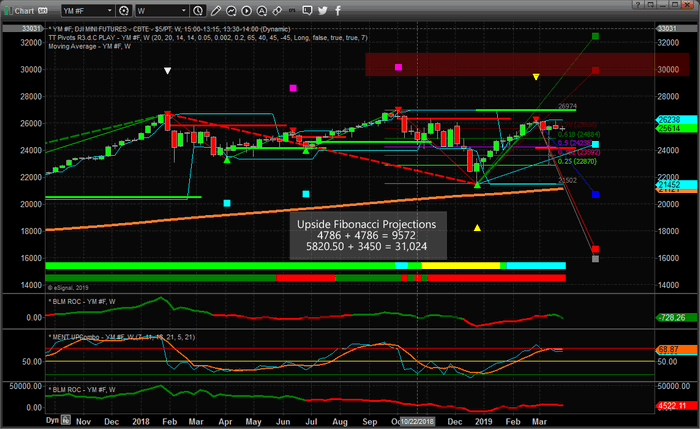 The upside potential could be as large as +20% to 25% or more. The red box on this Weekly NQ (NASDAQ) chart highlights the Fibonacci and Elliot Wave target levels when we presume a 100% upside price leg. Please remember the upside leg could be as large as 161%, 200% or more on this final Wave E (or Wave 5). The projected upside target levels on the NQ are near 9250 (or higher). 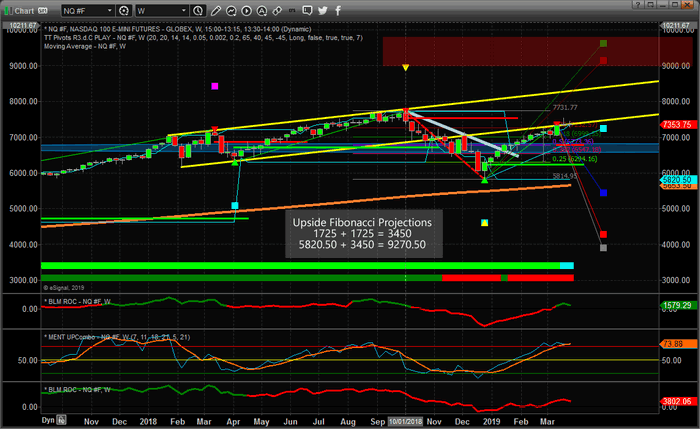 The same types of price projection points (or targets) using the Fibonacci and Elliot Wave theories predict a similar upside target level on this Weekly YM (DOW JONES) chart. Current price rotation suggests an upside target near $31,000 for the YM (or higher) before this upside move completes. Remember, the US Presidential election cycles typically mute price rotation a bit and present a bit of sideways trading. We’ve highlighted our expectations on the following Custom Market Cap Chart we follow that helps us determine where price levels are in relation to historical norms. You can see from this chart that we are currently sitting right at the historical middle pricing level going back almost 8 years. We would expect a moderate upside pricing bias to continue as we head into the US election cycle with mild price rotation. After the election cycle is complete, which is highlighted on this chart, we assume market price capitalization would be below historically normal levels and poised for an upside move (assuming a new US President is not elected with plans/policies to disrupt current GDP and economic growth factors). Typically, Wave E (or Wave 5) formations can be relatively short in structure, or at least as long as Wave A or Wave C. It is most common for Wave E formations to at least be as long as Wave C and in many cases, Wave E can extend well beyond Wave C length. Find out how our research and trading team can assist you in finding and executing better trades throughout all of these moves. We are about to launch our newest technology solution for our members at www.TheTechnicalTraders.com and we believe we provide some of the best research, daily video analysis and trading triggers you can find anywhere on the planet. We like to keep things simple and manageable for our members. We issue 2~3 trades a week (max) and we target 5~25% swings in ETF and stocks. We also provide incredible insight into the markets which allows you, the skilled trader, to make your own trading decisions while being better informed and understanding current market dynamics.